Check vacuuming off of your long list of back-to-school crap you have to deal with. Seriously. I NEVER MANUALLY VACUUMED MY LOWER LEVEL AGAIN. Even more exciting, those dust bunnies that seemed to pile up incessantly in corners and under the furniture went away, sucked up dutifully and daily by the Roomba. it lives on a charging doc, and upon the push of a button (or, you can set it on a schedule to run every day at the same time), it’ll navigate itself around one level of your home in a 45 minute cleaning cycle, sensing and navigating around obstacles as it goes. Roomba provides light to medium cleaning—perfect for everyday cleaning. Because of its low profile, it zooms under beds, tables, and furniture. You get best results if you run it daily, as it won’t necessarily hit every single spot on a level of your house every day, but run daily, it’ll eventually clean everywhere. Once the 45 minute cleaning cycle ends, it returns to its charging base on its own and recharges to get ready for its next cleaning. Was there an improvement over my old Roomba? Whether you’re a previous Roomba owner seeking an upgrade or new to robot cleaning technology (welcome…once you get a Roomba you’ll kick yourself for having vacuumed manually for so many years of your life! 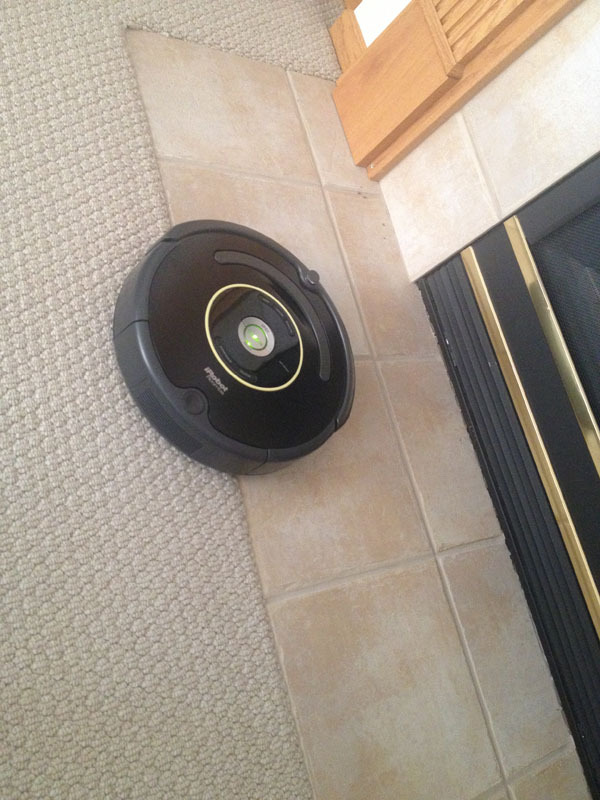 ), the Roomba 650 is a definite upgrade. The technology has improved; old obstacles (in particular, a PVC floor mat I owned) that perplexed my old Roomba are no challenge for the 650. The hair it picks up doesn’t seem to build up as quickly on the brush. The result—spotless floors—are still the same. Do you REALLY need a robot vacuum? If you’re short on time but love a spotless house, then yes. You need one. It’s worth it! All in all, while Roomba works on all dry surfaces (carpet, tile, laminate, hardwood floor, etc. 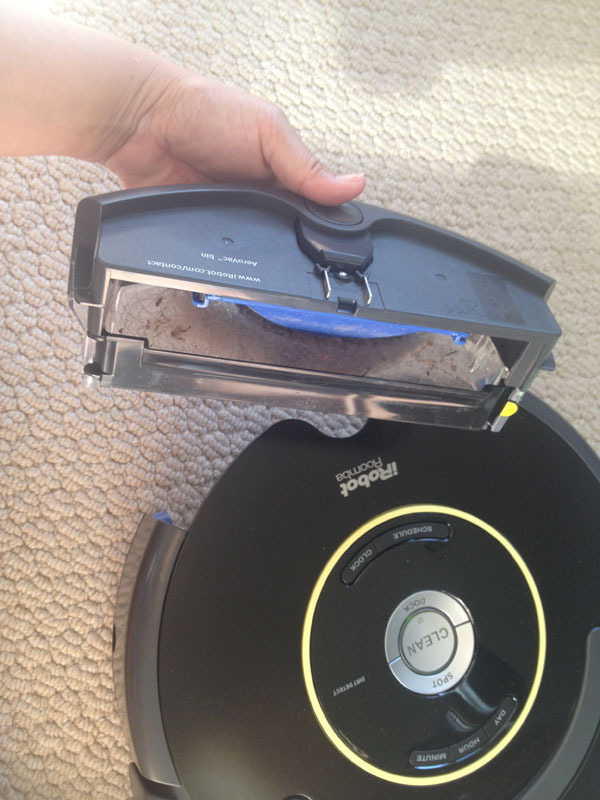 ), it’s having the Roomba work its magic on hard surfaces that makes it the biggest bang for the buck. I take it for granted until I go to other people’s houses and notice their dust bunnies here and there. (YES, I AM a horrible person for noticing people’s dust bunnies.) But when you get used to having Roomba’s daily, no effort floor cleaning, you also get used to having spotless floors. 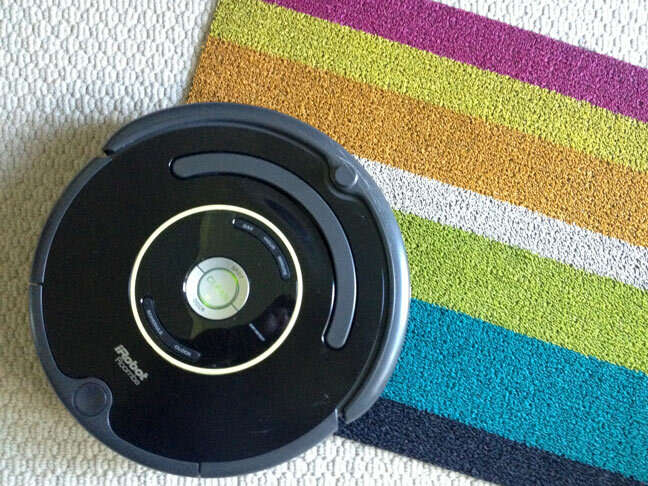 Check cleaning the floors off your list and leave it to Roomba. Whew. Learn more about iRobot’s family of products including the Roomba here. * I purchased my first Roomba (still in commission) in 2009. The Roomba 650 was provided for review.